Leo Mercer (alt. "Mercier") was a friend of William Branham's and one of two men in charge of recording all of his sermons. William Branham preached a sermon on August 15, 1965 where one of Leo Mercer's dreams played a prominent role. During the early 1960's Leo moved to Prescott, Arizona where he was in charge of a number of William Branham's followers who had migrated together to a place they called "The Park". Leo Mercier was accused of homosexuality by Lee Vayle, and accused of molesting and abusing children at The Park in testimony given in the Supreme Court of California. 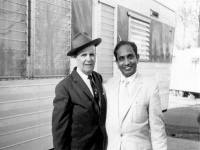 Leo Mercier and Gene Goad were mentioned by William Branham as early as June 4, 1955 when he said, "Here sets Leo Mercier and Gene Goad down here, friends of mine with the my recorders." "And Leo Mercier...and Gene Goad here is the tape boys, the official tape boys of the campaign. And they taken this position so that they could go around in the meeting. They are my brothers and my friends in the Gospel. Mr. Goad here is right from your city, or close to it here. Mr. Mercier was formerly in a Catholic from up here in Michigan somewhere, I believe. They formed their little FBI party and come down to find out whether that gift was true or not. They found it, as the Lord always does. And now, they've been with me for some time. How long you been along, Brother Mercier? Four years. Found them to be real, honest boys, right on the mark." One of William Branham's last services, "Leadership" was spoken in Prescott on October 31, 1965 where he said, "Dear Jesus, I cannot express my--my feelings and my gratitude towards Brother Mercier, Brother Goad, and all these fine people and their little children." If William Branham saw a vision of what would happen to Leo Mercier, why did he not protect the men, women and children of the Park from the 'false doctrine'? Why did William Branham continued giving Leo Mercer great character references wherever he spoke? Did William Branham really discern Leo Mercer's problems? 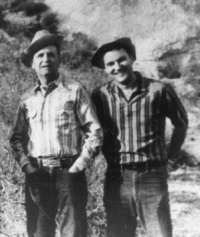 William Branham used the phrase "Tape Boys" to refer to Leo Mercer and Gene Goad. Why does Voice of God Recordings continue to sell "Tape Boy" pins to young boys and girls if the legacy of Leo Mercer was child abuse and homosexuality? Child abuse is not simply "false doctrine". What Lee Vayle read in the book of prophecy should be questioned, because as far as we know Leo Mercer only taught what the tapes said. Lee Vayle affirms that a book of William Branham's prophecies did exist. Where is it? This page was last edited on 31 August 2015, at 02:00.